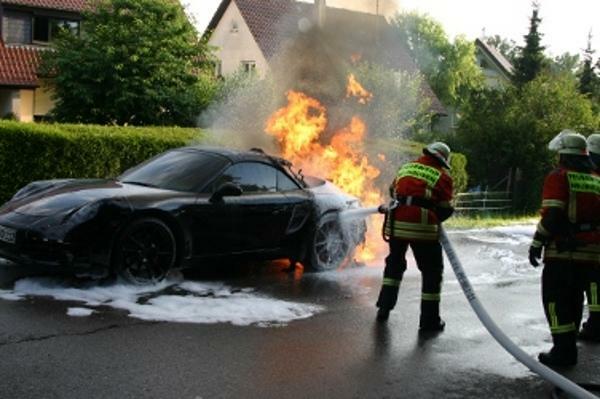 On the outskirts of Steinegg Germany a new Porsche 911 Cabriolet prototype went up in flames during a routine test drive. The fire originated in the engine bay on this new Porsche 991 prototype which was specially developed for the Chinese market. According to fire chief commander Klaus Buchinger, “The car has burned like tinder.” The car was completely burnt out within 15 minutes. According to one speaker, was the new Porsche 911 camouflaged on a test drive with the engine variant, which was developed specifically for the Chinese market.